Curator Anastasia Rogers scored and evaluated numerous members from the KiptonART registry that features over 950+ artists. Nine promising talents who are living and working in New York were selected: Julie Combal, Marc Dimov, Zac Gross, William T Hillman, James Kennedy, Avery McCarthy, Jonathan Pozniak, Paul Seftel and Jim Sperber. Meet each of the artists here: http://www.kiptonart.com/magazine/index.php?req=article&id=528. The exhibition is open to the public from July 11 - September 6, 2010. Julie Combal's visible brush strokes, unusual angles and contrasting reflections aim to mystify the viewer's experience of her paintings. Marc Dimov utilizes natural light and is further aided by digital techniques to launch his audience into the perception of a fantastic locale. Zac Gross' painterly canvases depict nautical scenes using a limited palette, following in the Impressionist tradition of 'en plein air': bringing the studio outside. William T Hillman's photographs are glossy cibachrome prints, creating the sensation in the eye viewing the subject, rather than accurately recreating the subject. Each of the nine exhibited artists challenge the critical perception of nature through another individual's lens. Some works provide a glimpse of optimism and renewal, while others tell a personal narrative of a specific setting. Their commonality lies in the artists' success in capturing the essence of their subjects and in delivering an impression. KiptonART is currently looking for its 2011 Rising Winners. Twenty finalists will be exhibited for the month of October at the D&D Center in New York City during Market Week. Thereafter they will be exhibited throughout 2011 in Miami, Houston and Los Angeles. For more information, visit http://www.kiptonart.com/kipton-art-rising. Founded by Kipton Cronkite in 2002, KiptonART works with emerging artists and introduces them to art collectors both on and offline in “Access” spaces throughout New York City. 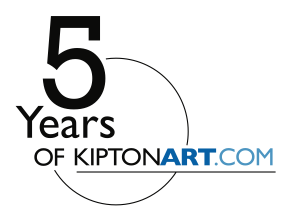 The KiptonART portfolio currently boasts over 900 emerging artists with work available at various price points. KiptonART’s seven member curatorial board is actively engaged in the organization, kiptonART.com/curators, and our online community consists of thousands of emerging artists, collectors and gallery owners. Each artist who subscribes and pays an annual fee of $75, is vetted by our curatorial team who works to ensure artistic quality and integrity. Site visitors are able to discern an artists’ experience according to a three tier ranking system that analyzes education, technical ability, exhibition credits, press, and curatorial scoring. For more information on the KiptonART Rising Program, visit http://www.kiptonart.com/kipton-art-rising.